Need help finding the right Door Hardware for your application? We'd love to help. Our showroom hours are Monday - Friday 9-5 Mountain time. Give us a call or send us an email by clicking on the contact us link below. 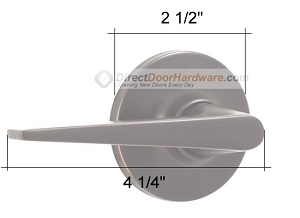 Most door hardware will fit the following door preparation. If you have something different, please contact us so we can help you find exactly what you need. What is Standard Door Preparation? Thank you for submitting your review. 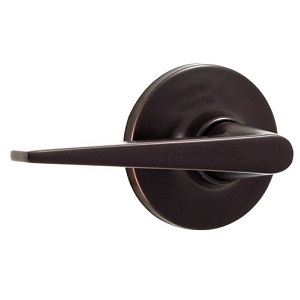 The Weslock Urbana lever has great modern design and is available in Satin Nickel and Oil Rubbed Bronze finishes to coordinate with your other Weslock door hardware. Weslock Urbana levers are shipped with square and rounded corner faceplates and strikes. Drive in latch is available upon request. - Meets ANSI A 156.2 Grade II cylindrical lock standards. - 2 3/8" or 2 3/4"
- Fits doors from 1 3/8" - 1 3/4" thick. Click here to learn how to determine the handing of your door. Please allow 1-2 weeks before shipment for Polished Brass, Antique Brass, and Satin Chrome finishes. A Lever for both sides of the door, latch mechanism, strike plates and mounting screws. A Lever for both sides of the door, latch mechanism, generic unlocking tool, strike plates and mounting screws. A Lever for both sides of the door, latch mechanism, keys, strike plates and mounting screws. If you have several keyed locks keyed alike, there may not be a key for every lock shipped. Thank you for your question. Thank you for your answer. Not sure What You Need? Weslock Lever Handles are available in several functions. Please review the descriptions below so you can order the correct door lever for your application. Weslock Passage or Hall and Closet Lever Handles are used on doors that do not require a locking mechanism. Halls, closets, pantry or laundry doors will generally use a passage leverset. Passage levers do not have a locking mechanism. Weslock Privacy or Bed and Bath Door Levers are most often used on Bedrooms, Baths or Office doors where a lock for privacy while occupied is desired, but a keyed lock is not really necessary. Weslock privacy levers have a Push button on the rosette or backplate as shown to the left to activate the lock. On the outside, there is a pin hole for emergency unlocking. Some levers will have a pin hole inside a circular piece, some just have a small pinhole. Weslock Keyed Entrance Door levers are generally used on exterior doors, but sometimes used on interior doors where security is a concern. Weslock keyed entrance leverss have a push button lock on the inside backplate, similar to a privacy lock. On the outside there is a keyed cylinder. If the Lever is locked from the inside a key is required for entrance. If you are ordering several keyed locks of the same brand we can key them alike for you. Weslock Single Dummy Door Levers are sold individually. Dummy levers do not have a latch or mechanism of any kind. These levers are surface mounted to a door that has not been bored (large hole cut out) for a lever. Dummy leverss are generally used on double doors that us a ball catch at the top to keep them closed so a latch is not required. They are also commonly found on the inactive side of a french door - a single dummy mounted on either side of the inactive door. Weslock door hardware products are covered as long as the original purchaser owns or occupies the premises on which the product was installed. For complete warranty information see Weslock Warranty. Got these to put in the company offices and the finish was chipped on almost every single one. I called and they said that I must have gotten a bad finish batch but there's no telling how big that batch is. Have used these in several house locations and are well made, easy to install, and attractive. Copyright Direct Door Hardware. All Rights Reserved.